I have so many primers in my collection at the moment and some of them are amazing so I thought it would be a fantastic time to do a primer roundup to let you know what I think of all of them. This stuff is seriously amazing and I have already sung praises of it before. It has completely changed the way I apply my favourite Nars Sheer Glow foundation and made it so much quicker and easier. Unlike most other primers I do notice that my makeup lasts significantly longer and though my makeup usually sticks around on my skin fairly well, this one keeps my base more flawless and my colours more intense throughout the day. Basically I love it and you need to try it! They do make a small 20mL tester size for $16 as well as offering a 30-day money back guarantee so you have nothing to loose. Also, I definitely only use a tiny bit of this each time so it will last forever; longer than $50 worth of any other high end primer. It is also silicone free so a good alternative to the vast majority of silicone based primers if you want something different or don't like silicone formulas. This is actually quite an expensive for a drugstore primer considering it is only 15mL but at the same time you only need the tiniest bit of this on the parts of your face with larger pores and it is constantly on sale (I often see it at Coles for 30% off). I usually put it on my t-zone to even things out and follow with up with another silicone based primer all over. I don't use it everyday, just for when I want a super smooth and poreless base for special occasions. It is amazing and really does what it says because it is like a thicker and even more velvety version of the Benefit Porefessional which fills in pores so well. Also, unlike the Garnier Blur Cream (which I hated!) it sets nicely and doesn't feel weirdly oily and slippy for the rest of the day. If you have large pores and have trouble applying your foundation smoothly on your t-zone check this one out! This is hands down the best cheap drugstore primer I have ever used! For only $11.95 you get a huge 50mL which lasts forever because I have only just had to buy my second tube. It is a silicone formula (dimethicone) but it doesn't feel like a typical silicone primer, and is much more like a lightweight moisturiser. It makes sure your skin is a nice smooth, moisturised base for foundation application and longer wear. Even as I dabble in various more high end primers I will always have this one in my collection! Unfortunately the same can't be said for the Face of Australia silicone primer which has that weird slippy texture that won't set. I have also tried the SPF version and while it is okay I just hate the sunscreen smell. Definitely go for the one in the purple tube, you won't be disappointed! Okay so I absolutely love Nars so this one might come as a bit of a shocker but I was really disappointed by this primer. I wanted so much to love it (especially considering the price tag) but it is the only product I've ever bought from Mecca that I was a bit disappointed by. It isn't that it is horrible but it just doesn't seem to do anything. It certainly doesn't help my Nars Sheer Glow apply easier which is what it is designed to do which is a bummer. I find my Sheer Glow pulls and doesn't apply smoothly which leaves me with big visible dots on to pores around my forehead that need to be really rubbed in with my fingers. Keep your money and buy the Face of Australia one which has a similar feel and texture but works better for a quarter of the price. So many people rave about this so I just had to try it out. I also used it on some models when I helped a makeup artist friend out and really liked the feel of it. It was a bit more watery than I expected but it is a great primer! It is silicone based so it gives you that gorgeous velvety skin once it sets. I have also heard it helps to minimize redness but I don't have red skin so I'm not sure. The only downside is the price and while I feel like it is a great high end primer, I can't see myself spending $69 on the 30mL bottle. I got this sample in a Kit Cosmetics goodies box it is the first thing I have ever tried from Bare Minerals. I have never really been into the mineral makeup thing and I HATE loose powders so I never really looked into the brand. Despite never really trying to brand, I actually really like this one. It is a clear silicone formula that has that dry, super velvety feel reminiscent of the Benefit Porefessional Primer. It made my skin very smooth and gave me a great base for foundation to buff in flawlessly. I think I still might like the Benefit one more but this is a great cheaper alternative with a very similar feeling formula. I was actually really impressed with this one, as with all the Max Factor products I have tried lately. It is also a silicone based formula that sets to a smooth velvety finish that makes foundation glide on so easily. When you first apply it, it has this sort of sticky and tacky feel that isn't at all unpleasant or uncomfortable because it quickly sets to a powdery feel. Because of this tackiness though, it feels like it is really adhering to your skin and forming a great base. My makeup lasted well and basically this primer did everything it was meant to. While this primer is on the higher end of the drugstore price point it easily holds its own against the high end competitors and is definitely worth trying out. So there you have my impressions of all of the primers in my collection. All of them have their own merits and perform well except of course for the Nars which is really disappointing because Nars is generally one of my favourite brands and it was so darn expensive. 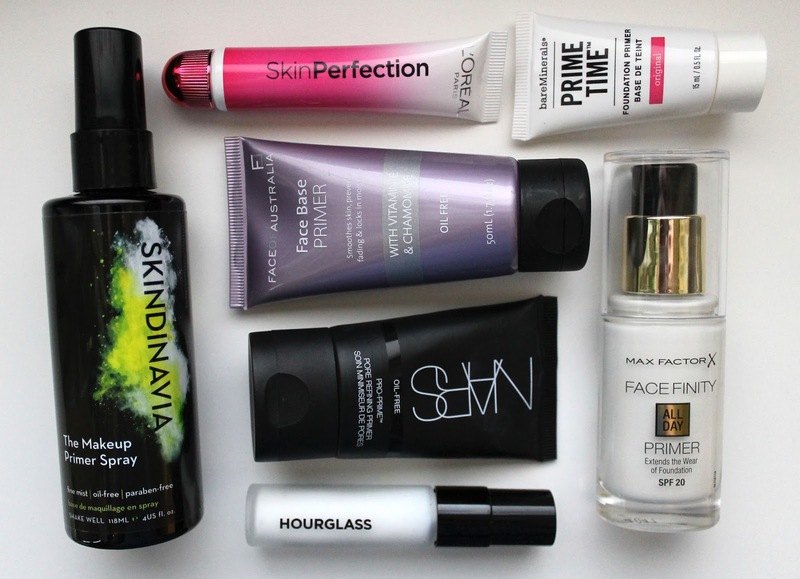 What are your favourite primers? Do you have a different skin type to me, for example oily or very dry, that you have found your holy grail primer for? Let me know below in the comments. Disclaimer: I received the Skindinavia Primer Spray and Max Factor Face Finity All Day Primer as PR samples but rest assured that doesn't affect my opinion of them. I always provide honest reviews and opinions. 3 comments on "Primer Roundup"
The only one I've tried is the hourglass, which Im sad I'm running out of! It is expensive but wow, best primer ever and the larger size seems to last ages. I only use one pump most days and it's lasted quite a long while. Might have to pick up one of your other picks and have a test!